Expertly ordering a martini exudes confidence and shows personality. But despite the fact that such precise instructions for the bartender can sometimes sound like indiscernible code, getting to this level just takes a little understanding of the drink’s history and ingredients. 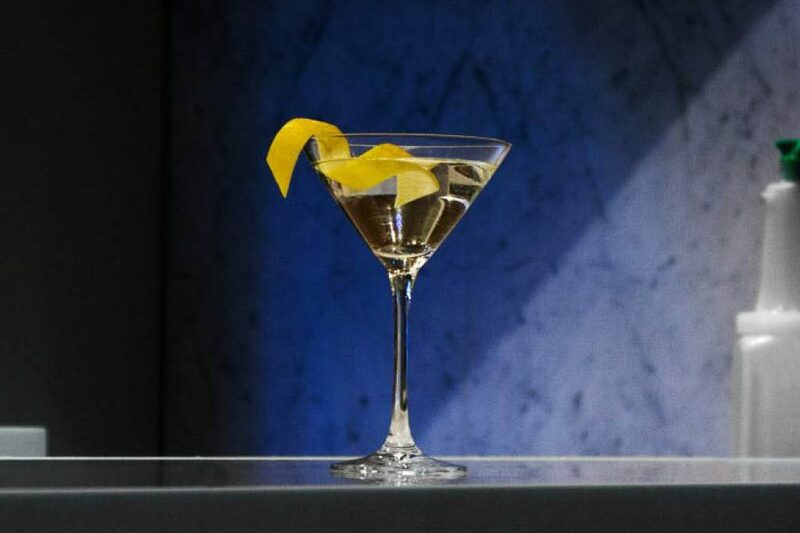 The origin of the martini is somewhat muddled, but it is commonly believed to be a variant of the Martinez cocktail that consists of gin, sweet vermouth, and bitters, with a whisper of maraschino and lemon. The Martinez also comes with an unreliable history, said to be created in the 1860s in San Francisco’s Occidental Hotel, where the legendary bartender Jerry Thomas worked. However, the drink first appeared in print in 1884 in O.H. Byron’s Modern Bartender, listed as a gin variation of the Manhattan cocktail. The people of Martinez, California claim it was created there even earlier, in the 1840s, during the gold mining period—but there is no recorded evidence to prove that. Vancouver has its own variation of the Martinez: the Vancouver Cocktail. It was modified at the West End’s Sylvia Hotel, where the maraschino was replaced with herbal Benedictine and orange bitters in the 1950s. It is said to be actor Errol Flynn’s last cocktail before he died. There have been many variations of the classic martini over the cocktail’s years, the most notable to date being the change from sweet vermouth to dry vermouth, and the removal of liqueurs that were believed to mask the imperfections of lower-quality spirits, or those that simply had a sweeter palate during that time period. When ordering a martini, start by picking a spirit. Originally the concoction was only ordered with gin (while a vodka martini was called a Kangaroo cocktail), but in modern times it can be made with either one. Gin is a neutral spirit with the addition of botanicals, the most prominent being juniper berries. Vodka is described as neutral in taste, but many brands offer different flavour profiles depending on what they are made from: wheat, rye, potatoes, or grapes. Choose your preference. There is no right or wrong here. The next step is to add some dry vermouth. This aromatized and fortified wine complements the cocktail really well. If you like vermouth, it’s best to order in ratios: half/half (equal parts); two to one (two parts spirit to one part vermouth); perfect (a blend of sweet and dry vermouth); wet (healthy pour of vermouth, not specific); dry (half an ounce of vermouth or less); extra dry (vermouth stirred over ice or in glass, and usually discarded before adding liquor); or no vermouth (self-explanatory). Some of the optional decisions are the most fun to order: straight up (or just up) means served in a chilled martini glass, no ice; dirty is the addition of olive brine, which adds a salty component (the brine consists of olive oil, sugar, vinegar, and commonly a preservative); burnt is a rinse of scotch in the glass; and bruised refers to the gin: can you bruise it by shaking it? The short answer is yes. You don’t have to necessarily request it shaken or stirred—if you don’t specify, it should be stirred. Then comes the garnish. Olives should be ordered in odd numbers: one or three. Myth has it that during the “glory days” at a Mafioso hangout, if you were served two olives, it was a warning sign that you were in danger. Fresh olives are always best. A twist means lemon, and Gibson means onions. You can rattle off your preferences in any order and it will still yield the same result: a vodka martini, straight up, dry, twist—or dry vodka martini with a twist, straight up. And finally, to clear the muddy waters of the “martini menus” that are often available at restaurants, serving a fruity cocktail in a martini glass does not make it a martini.